This week’s blog post features another in our series of interviews with Charleston’s movers and shakers who are working to make Charleston more livable for everyone. We celebrate Kurt Cavanaugh’s one-year anniversary as the first full-time Executive Director of Charleston Moves, and applaud his efforts at getting the message out to make our roads, sidewalks, and paths safer (and therefore more enjoyable) for bicycling and walking. Kurt, tell us about your organization’s mission and how that relates to the concept of livability in Charleston? Charleston Moves advocates for safer streets for people who walk and ride a bicycle in Charleston County. We are a nonprofit organization that began in the 1990s as the Charleston Bicycle Advocacy Group (CBAG). We all have C-BAG (said like, “sea-bag“) to thank for ensuring that the replacement bridge over the Cooper River, the Ravenel Bridge, included access for people, not just vehicles. The result, Wonders’ Way, is arguably the best route to bike and walk in the entire state. As an organization, we want to share what we have discovered – that Charleston’s beauty is best enjoyed on the seat of a bicycle or on your feet. Wherever you go, our work aims to make your bike ride or walk safer and more convenient. 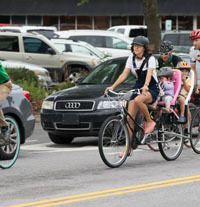 Charleston Moves is not about bikes as much as it is about building and enhancing a safe, connected, livable, lovable community. Now, for the hard question . . . if YOU were mayor, what would you do? My first effort if I were Mayor of Charleston, would be implementation of the approved bike and pedestrian lane on the Legare Bridge in cooperation with Charleston County, the entity in charge of funding, designing, and installation of the lane. This lane will be a linear parkway by virtue of extending the West Ashley Greenway and connecting with the waterfront walk around the peninsula. It really is the linchpin for safe, convenient access between West Ashley and the peninsula. Coupled with basic intersection improvements to bring cars and bikes safely downtown, it is also an example of smart, “people first” planning for our entire region, and offers downtown and West Ashley residents another viable transportation option for work and play. Your organization focusses on walking as well. Any particular efforts you would, as mayor, put in place to make walking a safer and more pleasant experience? Visitors drive hundreds of miles (and spend millions of dollars) to walk around our historic district. To better serve locals and visitors alike, I would implement and enforce a blanket 20 MPH speed limit to limit the possibility of unwarranted deaths and injuries. At intersections with lots of pedestrians (Calhoun & East Bay, Market & East Bay, Market & Meeting, King & Calhoun, Hwy 17 in Avondale, Windemere), I would have No-Right-on-Red restrictions. To keep things moving we would also consider traffic signals that feature what is called Lead Pedestrian Intervals (LPI). These give people walking a slight head-start, normally 3 – 7 seconds, before motorists are given a green light. In South Carolina, drivers must yield to pedestrians in crosswalks. I would install yield signage IN THE CROSSWALK at strategic locations (MUSC campus on Ashley & Rutledge, CofC on Coming and St. Philip, in Avondale, in Windermere, and near attractions such as libraries, schools, parks, playgrounds, bus stops, and places of worship) since studies show that people pay more attention and are more likely to comply with these laws when these simple signs are present. Could you tell us a bit more about the comprehensive efforts to make riding bicycles a more integrated part of our transportation system? In March, Charleston Moves and the City’s Design Division asked residents where they bike on the peninsula. The routes submitted on PeoplePedalCharleston.com formed the initial step in the development of the City’s upcoming Downtown Bike Plan. The City’s goal of 1,000 routes was blown out of the water. 1,303 people submitted 1,738 routes! Almost 20% of the routes came from West Ashley. If I were Mayor, I would quickly install the recommendations that are outlined in the City’s Downtown Bike Plan. The best thing about the Plan (I’ve seen the draft) is that it is immediately doable. Most of the projects can be implemented quickly, and for pennies on the dollar, with just paint, signage, and traffic signal tweaks. May the days of “Share The Road Signs & Hope For The Best” be gone! Finally, I would repeal the rather draconian bike parking ban on King Street. Bicycles should not be confiscated if they’re locked to meters or signposts. Parked bicycles are not a pedestrian safety hazard. Charleston is a city, not a movie set, and people riding bikes should thanked, not punished. Thanks, Kurt, for your insights and efforts to make Charleston Moves such a big part of what makes Charleston special. Keep in touch with Charleston Moves here and on Facebook here. Charleston Moves is always (!) busy and membership has its advantages. You can count on Bike Month during May each year having some great events, including safe cycling workshops, Bike to Work Day, and the Ride of Silence. Everyone, regardless of skill or age, is invited to the sixth annual RIDEdwin coming up on Saturday, July 18,. The 3.5 mile fun bike ride around Charleston begins at 9 am at Cannon Park. Coming in October is the New Belgium Clips Beer and Film Tour. At IfYouWereMayor.com we believe that the first step to tackling the region’s transportation problem is recognition that our water-logged geography limits the extent to which road building can address the full extent of our transportation needs. Our existing infrastructure must be tweaked to accommodate a whole host of ways of getting to and fro – foot, car, bus, bicycle, boat, train – before we can throw more limited resources at building ring roads that really can’t do the job on their own.